May 1 is a perfect day for a parfait. 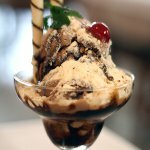 Enjoy chocolate sundae on National Chocolate Parfait Day, that falls on May 1. Parfait is a French dessert developed in 1894. This dessert was made with sugar syrup, eggs and cream. However it evolved to a custard-base ice cream flavored with fruit puree. The dessert was whipped to achieve an airy and delicate texture. When French parfait came to the USA, it was changed. American parfait is ice cream and syrup layered in a special glass and topped with whipped cream. Chocolate parfait, that we honor today, usually involves chocolate mousse of pudding layered with whipped cream, cookie crumbs, fruit or anything else that is delicious and goes well with chocolate. Chocolate parfait also can have a gelatin or yogurt base, and the rest of the dessert is built from there. There are hundreds of parfait recipes. They are all perfect for breakfast or dessert. If you want to celebrate National Chocolate Parfait Day, you should try making a perfect dessert to share with your family or friends.